What Does ‘Survivor’ Mean to You? Survivor is defined as ‘one to remain alive or in existence; to live on; to continue to function or prosper.’ To us, it is all that and it is synonymous for “hero” – a warrior and one who shows great courage.’ It goes without saying that one who battles and overcomes a life-threatening disease or illness, such as breast cancer, is indeed a hero. We want to honor all the breast cancer survivors, our heroes – today, tomorrow and always. 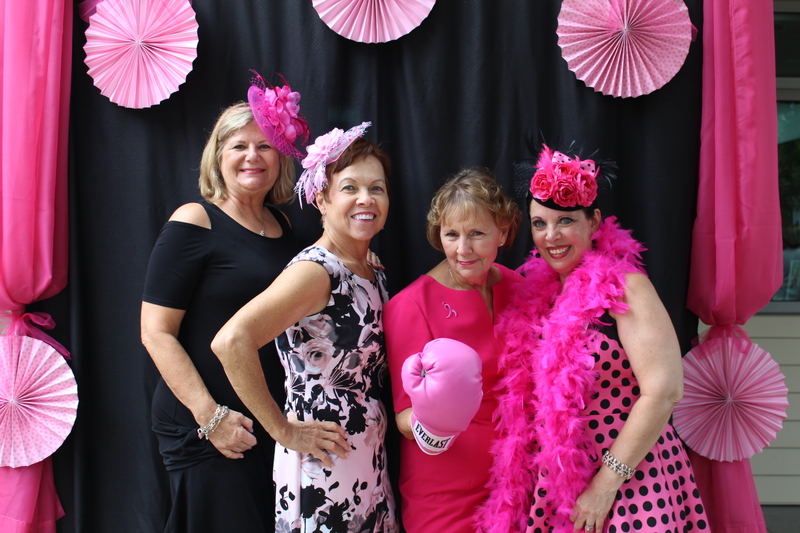 Susan G. Komen Orange County hosted its annual Survivor Celebration & Awards Banquet on August 12 at the Oasis Senior Center in Corona Del Mar. Themed “A Day at the Races,” it was a day that celebrated the survivors, role models and heroes. A special tribute honored our very own, Robin Pollok, who this year, lost her third battle against Stage 4 breast cancer. Pollok was best known for singing the national anthem at the start of the annual Race for the Cure. Despite the debilitating treatment sessions, she never missed a Race in the last 16 years. This is a true testament to her fight against her illness. This is the true mark of a hero. 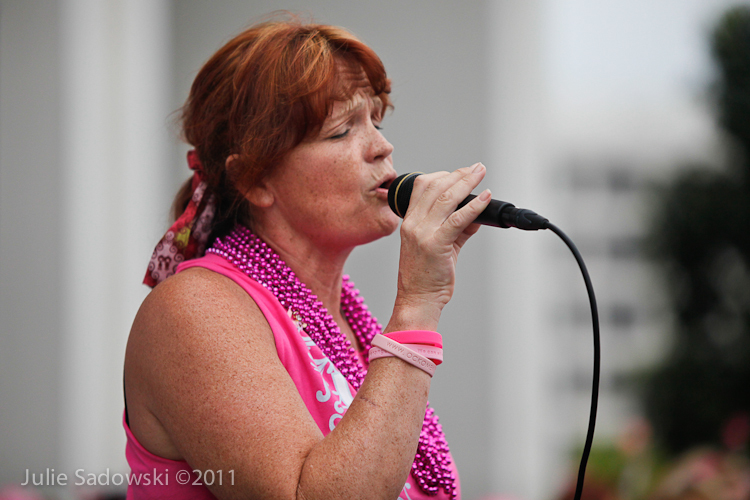 Carla Cammack, a survivor and Komen Orange County volunteer who held pivotal roles for several years at Race for the Cure including Race Chair. Veronica Mora, a young woman whose breast cancer was detected early, thanks in part to free testing funded by Komen. Louie Rodriguez, a retiree of the Long Beach Fire Department, was honored with the Most Inspirational Breast Cancer Journey Partner Award. Rodriguez stood by his wife who lost her battle against the disease in 2015. Together he and his wife started Pink Ribbons and Blessings, a breast cancer clothing and jewelry stored located in Orange. Reyna Crespo, who received the Outstanding Breast Health Advocate Award for her steadfast work in educating and recruiting Latina women to get free mammograms at Northgate Markets. Hats off to all survivors, volunteers and supporters – our heroes – for taking a stand against this disease that has claimed so many lives. In addition to our Survivor Award Banquet, we host various initiatives throughout the years to support our beloved survivors and their families. A special tribute to survivors will also be held at the Komen Orange County Race for the Cure on September 24 at Newport Beach’s Fashion Island. From September through February 2018, Komen Orange County is offering a Breast Health Education Series, free workshops that are open to the public, covering breast health topics including risk reduction, screening, diagnostics, treatment, metastatic breast cancer and survivorship. Information on these events and others can be found here. We hope to see you at an upcoming event! 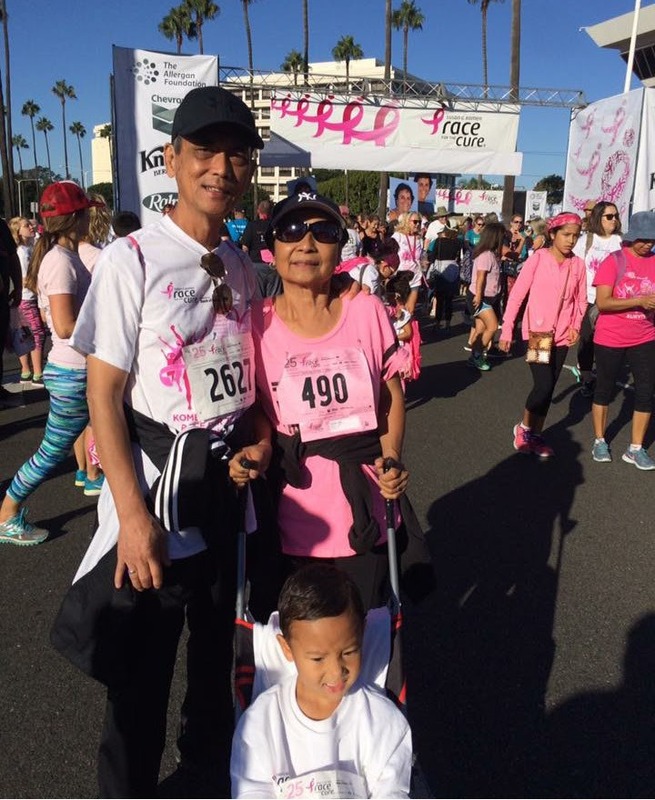 As we prepare for the 26th annual Susan G. Komen Orange County Race for the Cure® on September 24th at Newport Beach’s Fashion Island, we reflect on our loved ones, whose lives, as well as our own, have been affected by breast cancer. Whether we were diagnosed with the disease or we know someone who was, the news is life changing. Travis Benjamin, wide receiver and return specialist for the Los Angeles Chargers is no stranger to the devastating news: he has received it on three different occasions. First, when he was in high school, he learned his grandmother had breast cancer. Later, during his college years, his mother and aunt were both diagnosed with the disease. Fortunately, all three women were able to overcome the disease and are cancer free today! By banding together, he and his family conquered many hardships, coming out even stronger than before. This year, Benjamin is banding with Komen Orange County to raise awareness about breast cancer and encourage supporters to raise funds. We’re very proud to announce that Benjamin is the Honorary Race Chair for the September 24th Orange County Race for the Cure. As Honorary Race Chair, Benjamin agreed to shoot a public service announcement (PSA) at one of the Chargers’ training camps in Costa Mesa to promote the Orange County Race for the Cure and to remind us all how important it is to unite with our loved ones, survivors, supporters and volunteers in the fight against this disease. Stay tuned as we will share the PSA on our social media in the upcoming weeks. The Los Angeles Chargers are long-time supporters of Susan G. Komen and the fight against breast cancer. 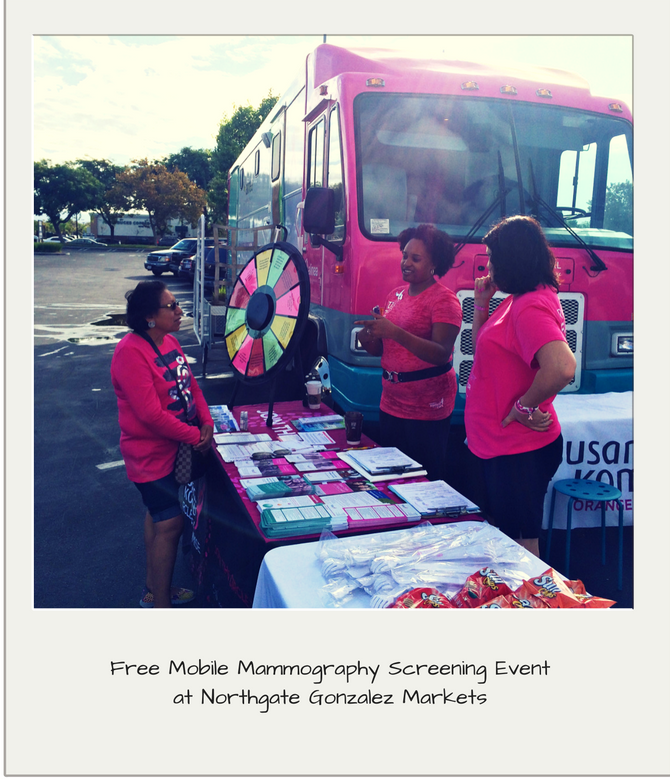 In past years, they have partnered with the San Diego affiliate, opening the Qualcomm Stadium to mobile mammography screenings onsite at games. Recently, the Chargers and the National Football League have teamed up in the campaign, “A Crucial Catch,” focusing on the importance of regular breast cancer screenings. During the month of October, players, coaches and referees will sport pink game apparel to raise awareness. This year, the Chargers will support Komen Orange County and the Orange County Race for the Cure by creating team “Chargers for the Cure.” Those who register on this team will receive a commemorative Komen/Chargers wristband. Anyone who raises $125 or more will be entered to win a pair of tickets to one of the Chargers’ 2017 home games. For more information or to join Team Chargers, visit www.komenoc.org/chargers. 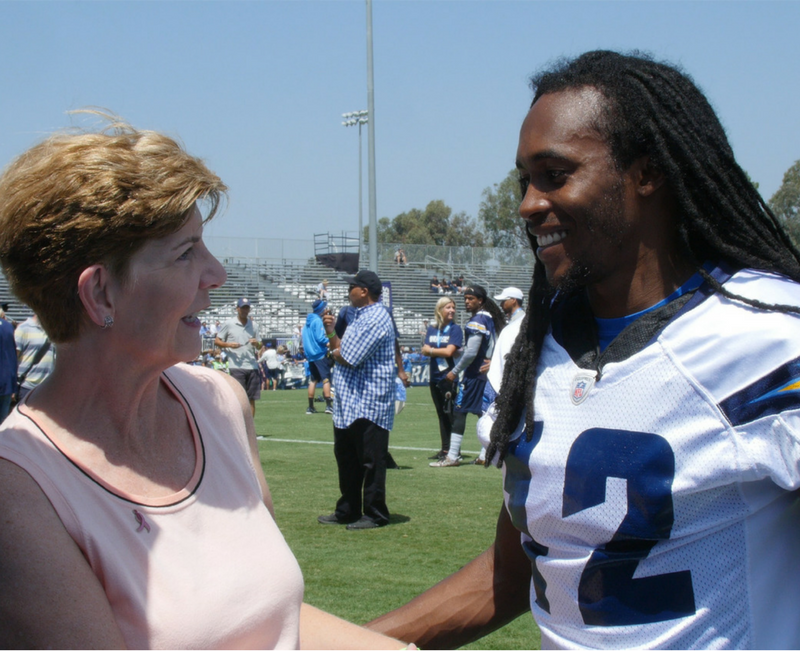 Komen Orange County Executive Director, Lisa Wolter, and Travis Benjamin at the Chargers training camp. 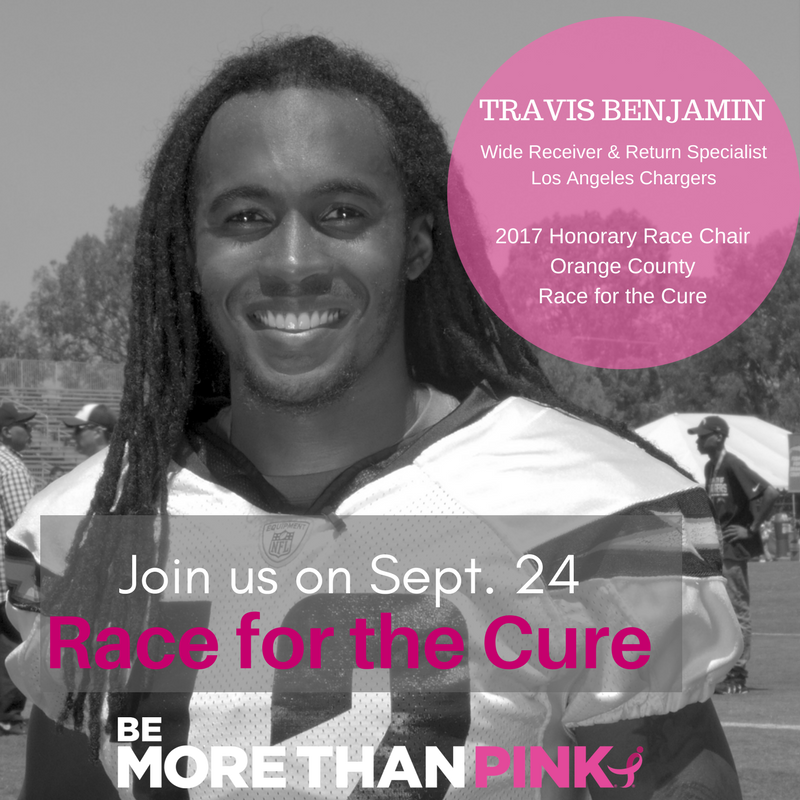 Benjamin invites YOU to band together and be MORE THAN PINK in the fight again breast cancer by registering for the Orange County Race for the Cure on September 24th. This year’s event features two 5K Run/Walks (7:15 a.m. for early risers, and 9:45 a.m.), a One-Mile Fun Walk for families and kids, a Breast Cancer Survivors Tribute, and a Wellness Expo. Register online today and donate $26 to receive a limited edition I AM MORE THAN PINK medal. For more information visit www.komenoc.org/race. What’s YOUR reason to Race for the Cure? We all have a reason to Race for the Cure®. On any given day in Orange County, more than five women will be diagnosed with breast cancer and one will die from the disease. Chances are, one of these women is a family member, a friend, or even a colleague of yours. Indeed, breast cancer does not discriminate: It can happen to anyone, regardless of age, race and ethnic affiliation, religion, income, and even gender! Judy’s reason to Race for the Cure is her parents. They were both diagnosed with cancer just 15 days apart during the Summer of 2015, her father with a nasal carcinoma and her mother with breast cancer. 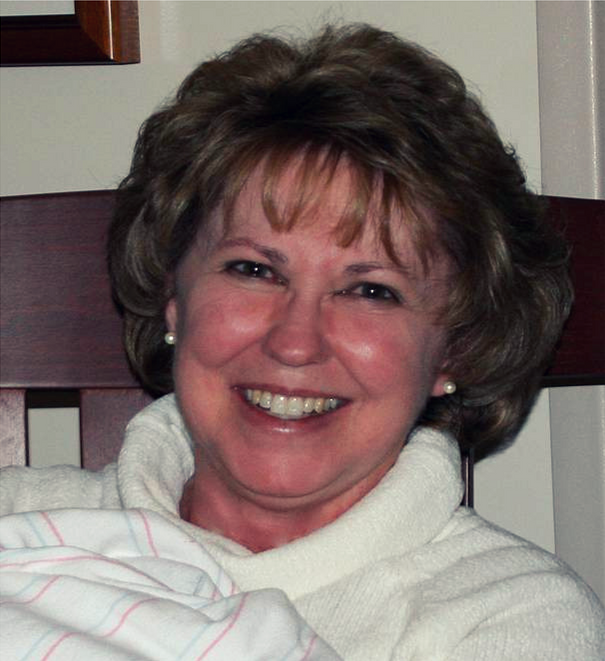 Feeling powerless, Judy witnessed them both undergoing treatments and enduring the challenges that come with it. She witnessed the first physical changes in her mom: hair first, then nails, and finally, loss of appetite. She also witnessed her mom’s resilience, her bravery and her resolution while making one of the toughest decisions in her life: getting a single mastectomy. Today, Judy’s parents are cancer free! Since 2015, it has become her family’s tradition to gather at the Race for the Cure as Team Mila. Their reason? Having experienced cancer, they understand that “even the strongest person couldn’t do it alone.” Breast cancer survivors and their families need a support system and Race for the Cure is one way our community can come together and provide this for them. We invite YOU to be MORE THAN PINK and join us on September 24th at the annual Race for the Cure, to celebrate survivors and pay tribute to those who have lost the battle against breast cancer. Your presence and your engagement means a lot to them. It shows that you care, and it gives them hope. Hope that a world without breast cancer is possible. 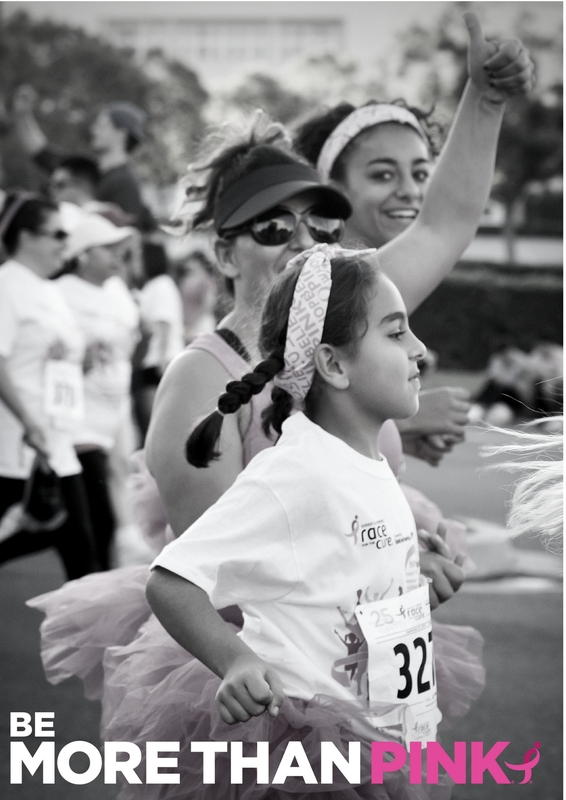 Since its inception in 1991, through events like the Komen Orange County Race for the Cure®, Komen OC has invested more than $38 million in community breast health programs and has helped contribute to the more than $920 million invested globally in research. 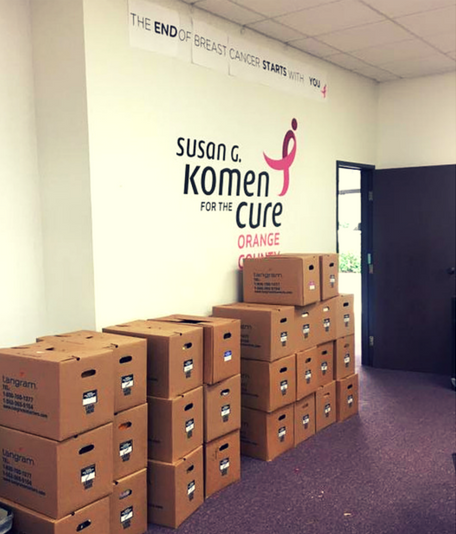 This fiscal year alone, Komen OC assisted more than 16,000 uninsured and underserved Orange County residents with their breast health care needs. Our bold goal is to reduce the number of breast cancer deaths in the U.S. by 50 percent in the next decade. We have no doubt that with your support, we can achieve it! Whether you’re a runner or a walker, there is something for everyone at Race for the Cure, including two 5K Run/Walks (7:15 a.m. for early risers, and 9:45 a.m.), a One-Mile Fun Walk for families and kids, a Breast Cancer Survivors Tribute, and a Wellness Expo. If you can’t join us in person, you can show support by opting for virtual participation when registering online! Don’t miss our early bird registration until July 31st! Additionally, if you register today and donate $26, you will receive a limited edition I AM MORE THAN PINK medal. If you’d like to form a team, contact Danielle Hamilton at 714-957-9157 ext. 26 or via email at dhamilton@komenoc.org for useful tips and recommendations. For more information, visit komenoc.org/race . After 16 years in Costa Mesa, we are moving! On Monday, March 27, our new address will be 2817 McGaw Avenue, Irvine, CA 92614. We invite you to join us at our open house on Friday, April 21st from 1 p.m. to 4 p.m. to check out our new home and enjoy some refreshments. It’ll be the perfect opportunity for you to tour our office, get to know us and learn about our services! No need to RSVP, just show up and say hello. What is your best memory associated with this office? Julie (Director of Marketing): The day I came in to interview for the position. I was so nervous driving to the office, not knowing that to expect. The interview process was nerve-wrecking and I remember telling myself, “What’s meant to be will be,” and here I am six years later loving what I do! Now, I feel like this place and my co-workers have become like a second home and family. Danielle (Special Events & Race for the Cure Teams Coach): I have enjoyed interacting with the many different groups meeting in our conference room (Race committee, Pink Tie Ball committee, Race Teams, volunteer and survivor groups). Our Team Captain Rallies, and hearing about the inspiring stories behind their involvement with Race for the Cure are among my favorite moments in the office. LarLeslie (Circle of Promise Community Resource Advocate): I’ve enjoyed most working with an inspiring and compassionate staff and meeting and planning with the African-American Breast Health Partnership to increase awareness and improve breast cancer outcomes in the community. Do you have a story about an event, a meeting, an encounter that took place in this office that inspired you, touched you or had an impact on you? Lisa (Executive Director): An event that sticks with me is a candlelight reception we held in the courtyard, where we shared stories about friends, families, and acquaintances who had been taken by breast cancer, remembering their courage, commitment, hopes and fears. Robin (Circle of Caring/Development): Each day, we have an opportunity to change the path for someone who comes to us for help. I discovered this when a survivor, Ann, showed up at our office, devastated and in shock. She had just been diagnosed with breast cancer and was scheduled for a mastectomy very soon. She didn’t know what to do, had little understanding of her own diagnosis or treatment plan, and had no idea what to tell her 12-year old autistic daughter. I comforted her, and together we contacted her doctor’s office and learned that there was no actual diagnosis and the scheduled mastectomy surgery prescribed by her doctor was premature. I helped her schedule a new appointment with a different doctor, and I provided her with Susan G. Komen materials to help her understand her new circumstances. Julie: The first survivor we lost after I joined Susan G. Komen was a woman named Kathy Voorhis. She was a beautiful person inside and out. My favorite memory was a photo shoot we did with her and a few other women for our Race for the Cure campaign that year. She was so hard on herself and her photos but that day, she was the most beautiful I had ever seen her. She radiated beauty through her smile, sense of humor and sincere kindness. She is dearly missed. Jennifer (Mission Programs Specialist): One of my favorite encounters was with a breast cancer survivor who needed assistance with hairpieces, and the feeling of wholeness she experienced when we find a wig that suited her. What are you looking forward to in the new office? Lisa: The new office will have a very welcoming front room with a couch and chairs, wood floor and be very close to the Resource and Wig Room. It will be nice for talking privately with people needing breast cancer information or referrals. We also will have a big new training room next to an open warehouse area so I envision some great celebrations and look forward to do our Race for the Cure registration and packet pick up right from our own space. Danielle: I am looking forward to the new office and the many ways we will be able to utilize our new training room and various multi use rooms with volunteers, supporters and survivors. We could not close this post without thanking our generous friends at Tangram Interiors who designed our new space, provided new furniture and helped us move. Thanks to their incredible work, the new office already feels like home! With Thanksgiving around the corner, we’d like to share the things we are so thankful for. Over the past 25 years, YOU’ve helped us raise nearly $38 million toward the Komen promise, money that was invested to provide breast health services right here in Orange County and help fuel live-saving national research. We’re incredibly grateful for our volunteers, you are the lifeline of our organization. 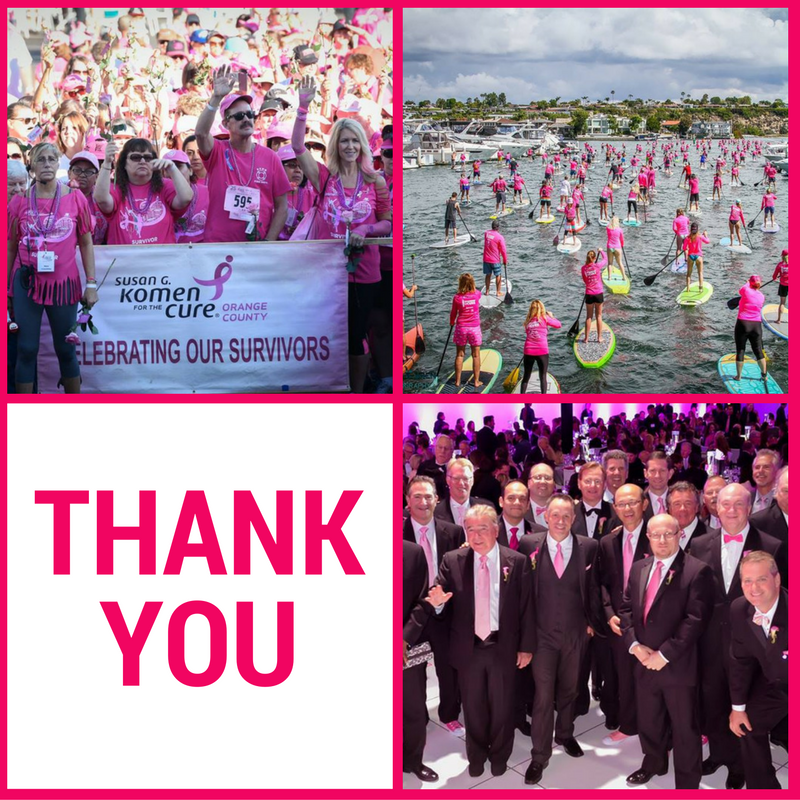 Thousands of you donated your time to us this year, helping with outreach education, office-based projects and our signature events such as Race for the Cure® and the Pink Tie Ball. Each of your individual efforts carries forward an immeasurable improvement for the lives of those who are affected by breast cancer. We’re so thankful for our sponsors, whose support and generosity has been instrumental in our success. We’d also like to thank our donors. 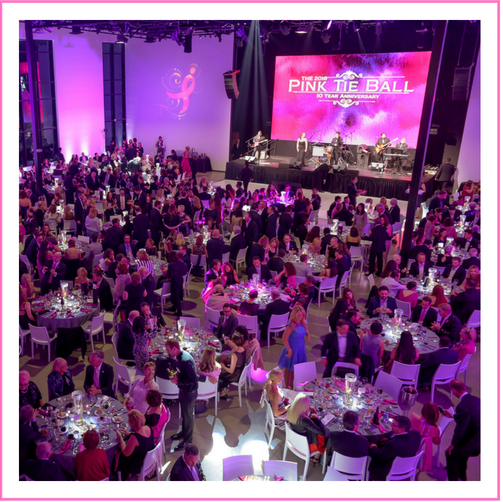 Every single dollar raised not only brings us one-step closer to finding a cure, but also improves chances of saving lives through education and a variety of breast health services addressing the needs of the most at-risk populations. In 2016 alone, we were able to award $870,000 in grants to 13 diverse, local organizations in your communities. We’re thankful for our board of directors. Our members are active and devoted community leaders, their tireless work has enabled us to establish and maintain meaningful and strategic relationships with local partners. Finally, we’re thankful for our wonderful staff. Your energy, enthusiasm, devotion, love and compassion are one of our most powerful assets in the fight against breast cancer. The journey to the eradication of breast cancer is not an easy one, but your unconditional devotion provides hope that it can be achieved in the near future.